BOONE, Iowa — AGCO Corporation (NYSE:AGCO), a worldwide manufacturer and distributor of agricultural equipment, put its new Fendt® IDEALTM combine center stage in the AGCO exhibit during the 2018 Farm Progress Show in Boone, Iowa, Aug. 28-30, 2018. This is the first of many public appearances the innovative combine harvester will make at U.S. farm shows this fall. The new Fendt IDEAL combine is the first “clean-sheet” design of an axial combine in the industry in 30 years. It sets a new standard for harvesting automation, blending Fendt’s tradition of engineering innovation with the most advanced operating technology, to deliver what producers around the world told AGCO they want in a combine — in-field efficiency, unfailing uptime, totally simple operation and better grain quality. 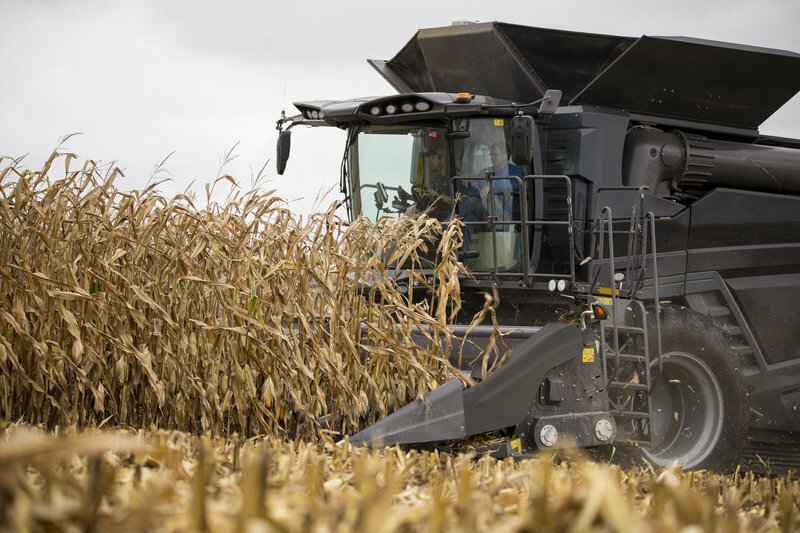 “We know harvest is a critical time, experienced operators can be hard to find and every bushel from every acre counts,” says Caleb Schleder, tactical marketing manager for combines. “The Fendt IDEAL is a game changer because it is highly automated, but easy to operate. We created this combine to bring our customers peace of mind that they can go to the field, run steadily all day long and get the crop harvested with great efficiency and minimal downtime. “We’re backing that up with best-in-class customer support through the Fendt Gold Star Customer Care Plan,” says Schleder. After seven years of vigorous testing in the most extreme conditions in a variety of crops, the Fendt IDEAL combine joins the proven and popular Gleaner® transverse rotary combine and the Massey Ferguson® 9500 Series axial combine in AGCO’s harvesting portfolio. The Fendt IDEAL will be available in Class 7, 8 and 9, to match the harvest capacity needed by any operation. Headers featured for small grains and canola include the 9255 DynaFlex™ draper head available in 25-, 30-, 35- and 40-foot models and the 15-foot 4300 pick up head. Additionally, the CommandTM Series corn head will be compatible with the Fendt IDEAL combine. The Fendt IDEAL combine sets a new standard for harvesting automation that makes operation easier, optimizes machine performance and ensures top grain quality. Equipped with the IDEALharvestTM system, these machines offer real-time visualization of crop flow inside the combine. A combination of specialized sensors determines what is grain and what is not and directs the IDEALharvest system to change the combine settings to achieve the operator’s pre-set harvest strategy. “The Fendt IDEAL combine automatically makes on-the-go adjustments to maintain established harvesting parameters, which reduces the effort of the operator as conditions change throughout the day,” says Schleder. An easy-to-use touch-screen tablet allows the operator to select preferences for minimizing grain damage, loss and material other than grain (MOG) in the bin. In addition, the IDEALharvest system compensates for sudden changes such as crop density and field slope, adjusting to maintain machine performance and grain quality. This technology is especially important when harvesting cereal grains where crop maturity, crop quality, plant health, stand variability and harsh weather can make harvest challenging. Several new features on the Fendt IDEAL combine help producers optimize grain harvested and deliver cleaner, high-quality grain, lowering the potential for costly deductions. The larger, redesigned rotor on the Fendt IDEAL combine is gentler on both the crop and straw. The new dual helix processor is 24 inches in diameter and nearly 16 feet long, almost 2 feet longer than the competition, which allows the materials to generate huge centrifugal force at a much lower speed and remain in the rotor for longer. The helix arrangement of the separation tines ensures exceptional threshing results and separates grain gently while the straw quality is maintained. In addition, this dual helix processor design allows the combine to operate at a slower speed, requiring less power to operate. Class 8 and 9 models use two of the dual helix rotors providing 43.7 square feet of threshing area. The class 7 is equipped with one rotor. Design innovations go beyond the rotor to the cleaning shoe where two specially molded, curved return pans use the full length of the threshing and separation chamber to distribute the crop evenly to the cleaning shoe, mitigating slope sensitivity. These IDEAL Balance™ pans enhance the efficiency of the cleaning system without adding complex active systems. With the industry’s largest grain tank at 485 bushels and the innovative IDEAL StreamerTM 6.0 auger, which boasts the industry’s fastest unloading rate at 6.0 bu./second, growers will spend less time unloading grain and more time harvesting. The Streamer 6.0 is standard on the class 9 and optional on class 7 and 8 which come standard with the Streamer 4.0 to unload at 4 bu./second. Both are gentle on grain and require less power than older auger systems. Power for the Fendt IDEAL combine and all main components is delivered through a straight-forward approach that provides the most efficient distribution of power. One gearbox attached directly to the engine drives the processor, cleaning system and hydraulic pumps, as well as the header. The Fendt IDEAL combine also uses fewer belts than other combines. Wet clutches ensure smooth engagement of the power, reducing wear and tear and maintenance on each component, and creating less strain on belts. The Fendt IDEAL combine also offers the full suite of AGCO Fuse® precision farming technology solutions to capture data that brings crop production decisions full circle, from planning, field prep and planting through crop care to harvest and storage. “The Fendt IDEAL combine offers many features and technologies that continue AGCO’s efforts to help producers maximize their productivity and their efficiency in the field,” says Schleder. “Field testing for Fendt IDEAL combines has been integral in the launch of this machine, and as we look toward the future with more advancements in the harvesting space, we will continue field testing in all regions globally to ensure the best product for our customers in their harvest and crop conditions,” says Schleder. To learn more about the Fendt IDEAL combine, or for customers interested in applying to be an IDEAL Elite customer, eligible for product demonstrations, visit IDEALHarvesting.com. To see more equipment related articles on BigAg.com click here.